Agatha Raisin fans have been patiently waiting for the second series of one of Acorn TV's most popular shows. That wait is almost over, because Ashley Jensen is slipping on her high heels and putting her sleuthing skills to work in the upcoming second series. 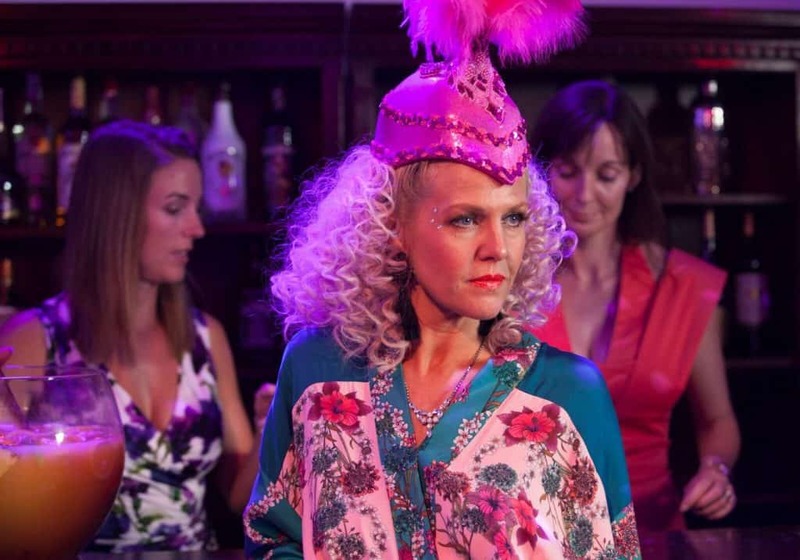 If you're just getting caught up on the show, Agatha Raisin is based on the novels by M.C. Beaton (who also wrote Hamish MacBeth). Ashley Jensen stars as the title character, a London PR expert who opts for a quiet early retirement in a charming Cotswold village. Things don't stay quiet for long, as Agatha becomes an amateur sleuth entangled in the town's mischief, mayhem, and murders. We had a chance to speak with Ms. Jensen about series 2, and she shared some of what's in store for Agatha and company. 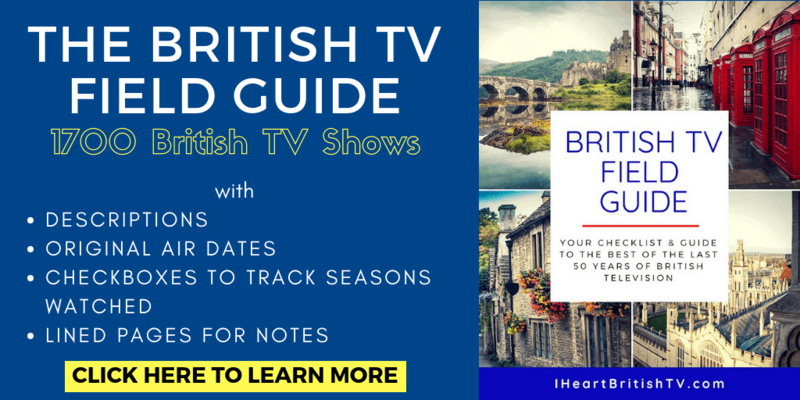 We also got to cover some fun topics like what British TV detective she'd like to see Agatha team up with, and trying to keep a straight face through a burlesque performance. We hope you enjoy this interview. Editor's Note: There were a few crackles and echoes here and there during the call, so there's a chance we may have missed a couple words in places. If something sounds a bit funny, blame that on us and/or technology, not Ms. Jensen – she's a hilarious and well-spoken woman! Some time has passed in Agatha's world since season one, how would you say that she's changed since the first series? Well, she was very much a fish out of water in the first season. She was very much a city lady that had arrived from the country and ingratiated herself to mixing within this community by looking at quiche for the quiche competition that she didn't make, she bought it. People find her brash and a bit rude, but as in the second season we find her… She's very much part of the community, and people have accepted her for who she is. And although, in some ways she still is a bit of a fish out of water, because she makes a very concerted effort to look like a fish out of water, because she sure as heck isn't (inaudible) well even a Barbour coat. She's continuing to dress in the way and the style which she's always dressed, in full makeup and stilettos through the countryside, but I think that she has sort of formulated friendships now with unlikely people, like the vicar's wife, and her cleaner, and the Lord of the manor. So, we've got this eclectic group of characters that all kind of merge together within the second season. What is your favorite thing about being back in Carsley? My favorite thing… we had an amazing summer this year, so it almost didn't rain at all when we were there, which was wonderful. As you know, it rains a lot in this country, but we had an amazing summer. So it looked absolutely beautiful, and the countryside that we film in, and some of the locations, are just absolutely beautiful. 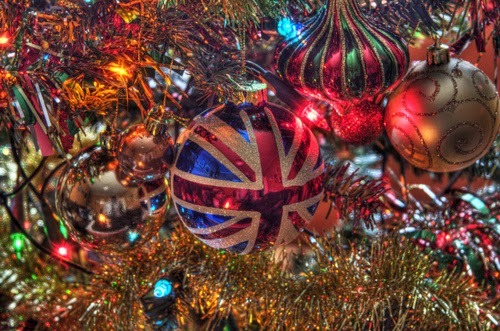 It's very chocolate box England, which I think is part of its charm particularly for an American audience, really. It's such a fun and delightful character to play. She's a character that just absolutely doesn't take ‘no' for an answer, and is utterly convinced that she should be doing whatever it is that she ought to be doing, even if it's slightly breaking the law. What would you say is the hardest or most challenging thing about playing the role of Agatha? Gosh, do you know what? I find the character such a gift of a character to play that I don't find it difficult. I mean, I suppose the only thing that's possibly difficult is the different types of terrain that I have to walk on with stiletto heels, because I've got two different sized feet, and sometimes that's a bit challenging, I would say. But I kind of look on challenges as a challenge, to be honest, and will not be defeated by it. And to be honest, as the character I think I set myself my own challenges, because if I see gravel and the line is, “She walks along the gravel path,” I tend to think, “Why walk when I can run?” And if I see a wall I'll be like… “Well, why? Let's just go over the wall rather than round the wall.” So I think I set myself challenges, really, which is part of the joy of it. …I think the essence of the character is still there, and I think who Agatha is is almost more important than what she looked like. And I think that, yes, you're absolutely right, in the portrayal of the book she had brown hair and was dumpy and was short and was from Birmingham. I am one of those things, I am short, but you can't even tell that on television, to be honest. You know, there was a conversation at the beginning, it was like, “Ooo, should I do an accent? Should I be from Birmingham?” I think that everybody just thought, there isn't any point in that, really, because a lot of these books were written in the early 90s, and I think that we were updating quite a lot of it anyway because she's no longer a smoker, and she doesn't wear fur coats, because that's a very different signal in this world these days. So I think almost like, the shell of Agatha was kind of incidental, really, and it's more about who she is, and her head and her heart. I think that's more what I'm more interested in, really. And I got the seal of approval from M.C. Beaton, so that's good enough for me. Were there any fictional British detectives who helped inspire your performance, or who you studied? To be honest, not really. I didn't look at … I tend not to sort of look outwards at other people and try and emulate someone else is doing, because I think that as a performer, it's better to be unique to yourself, and I think in life, as well. To be unique to yourself and embrace who you are, because there's nobody like you. So I've got a certain set of characteristics and qualities that I know that nobody else has. And I felt that this was an opportunity for me to sort of expand on what I have to do. But I think more in terms of the comedy rather than in terms of being a TV detective, I think that I kind of embraced more of the physical comedy than I maybe had in the first season. And was kind of allowed to do that, which was fantastic. For me, physical comedy, to see someone who's poised and dignified suddenly falling from grace, looking undignified, is extremely funny. I love that, and I love going back, thinking of it, somebody likened the character to a cross between Lucille Ball and Jessica Fletcher, and I thought, “Yes, please. I'll have that. I'll take that.” Maybe there's energy about the character, as well. There was certainly an energy for Lucille Ball, wasn't there? Are there any actors you'd love to see do a guest stint on Agatha? Oooh, gosh, that's not a question I've been asked before. Oh gosh, we have such a wealth of comedy actors here. And so many wonderful character actors, as well. To be honest, there's so many actors that I know that you would know, because they are just fine actors that don't happen to be a name, to be honest. But in terms of somebody that would be a name, I know that my good friend Ana Ortiz who played Hilda in Ugly Betty, who I'm still very much friends with, she's like, “Get me over! I want to play a part in Agatha.” …You could wheel her over and get her in, because she's … I think she would absolutely embrace the tone in the world of Agatha. If Agatha Raisin could team up with any fictional British detective from TV, movies, who do you think she would team up well with? I think it would probably be a man that she could bully a little bit, because she wouldn't take orders from anyone. So it could be any number of … I think she would get annoyed at Columbo because he looks a mess. So that maybe wouldn't work. Well, we could always get involved with Hamish MacBeth. That would be quite good. Yeah, let's go with Hamish MacBeth. That would be an interesting dynamic. What is it like working with your other costars in the show? It seems like everybody has a lot of fun with each other. Yes. It really does. I mean, a lot of the actors that we get on our show have their own careers, a real wealth of comedy performances and comedy shows. So everybody comes very kind of equipped to deal with the situation, and a playfulness, really…we kind of determined to have an atmosphere of playfulness on the show. The actors come in and they're like, “Oh, right. Oh, this is the tone of the show. It's not a soap. It's not a pedestrian detective show. It's a show that I can come in and be flamboyant and have a bit of color.” It's not just all about the lead actor, which sometimes these programs are, and a lot of the guest actors are sometimes coming in to support the lead actor, but I feel that this is very much a sort of ensemble piece where everybody has a color on the color chart that is Agatha Raisin, and that's what makes it a whole big rainbow of fun. Are there any scenes that come to mind that were particularly hard to get through just because you guys were laughing so much, or just couldn't keep it together? Well, there were a few that me and Jason Merrells, who played Sir Charles Fraith, him and I sort of sometimes couldn't look at each other in the eye. And if it was me, Charles Fraith, and Captain James Lacey, who the actor, Jamie Glover, is not half as uptight as his character is, when there's three of us who are all kind of around the same age, we're in the same scene together, we were just like, “Oh, no. No, no, no. This is going to be dangerous. Oh dear. Oh God.” And sometimes we had to take a little moment, and a little breather, the three of us. Out of the three installments in the new series, is there one that is your favorite? Oh, gosh, I mean, each one has such fun. I think they're all wonderful, but I do love the Wizard of Evesham. I love the fact that Agatha looked different in it, because, you know … With a TV detective I always think it's fun when you can spot the character from 100 yard because of the silhouette. And Agatha has the sharp, bold, the figure-hugging clothes, the tiny, little heels, and the handbag poised, because she never goes anywhere without her handbag because you just never know. What woman goes anywhere without a handbag? No one. That was fun to sort of change her silhouette with the mad hair, so that was good fun. It was an absolute joy to do the burlesque scene, as well. That was a lot of fun. Without giving away any spoilers, is there anything about this new series that you think will surprise fans of the show? Yes, I think that possibly, you know, she has this infatuation with Captain James Lacey in the first season, and she's kind of a little off the boil with him at the minute, and I think that people might be quite surprised when they have their Carsley Single Ladies' Society, that everyone joins in because everybody's a little off men, including Roy, who's an honorific member of the Single Ladies Society. Although, having said that, she doesn't sit at home and twiddle her fingers for too long. So there might be an interesting…with another character. Is there anything else you'd like to tell fans as they're waiting for new episodes? …I think that they're in for a whole load of fun, because it's just brighter and bolder and …Each episode is 45 minutes longer, so a lot more fun to be had! 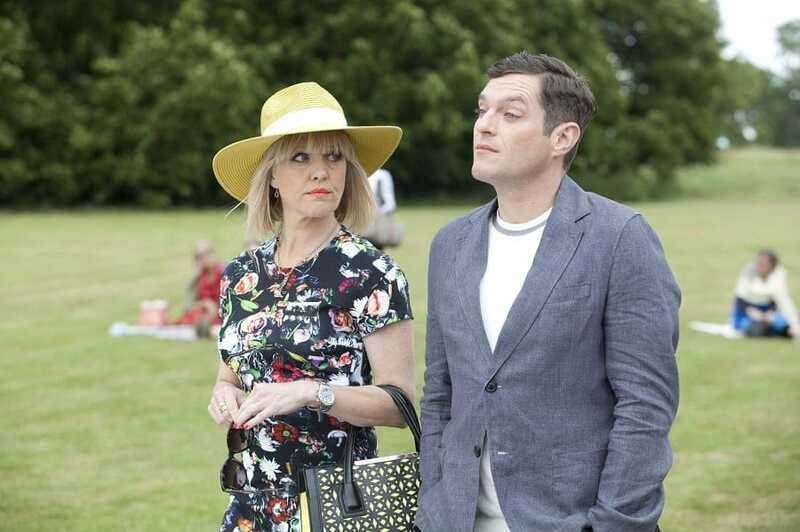 When and Where Does Agatha Raisin Series 2 Premiere? 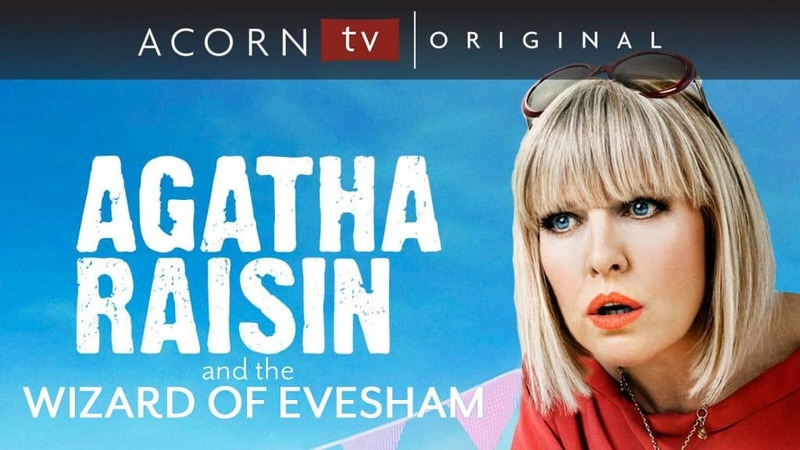 Agatha Raisin series 2 will premiere exclusively on Acorn TV, Monday, November 19th with The Wizard of Evesham. This movie-length episode follows Agatha Raisin returning from Cyprus with a broken heart, and a serious hair situation. Agatha takes advice from the local ladies, and heads straight to the handsome Evesham hairdresser Jonny Shawpart. The charming hairdresser sets his sights on Agatha's heart, but their future is cut short when a murder strikes at the salon. Agatha soon finds herself embroiled in a murder case, and not even Jonny Shawpart is above suspicion. Series 2 sees the return of Agatha's former assistant, Roy (Mathew Horne from Gavin and Stacey), friend Sarah (Lucy Liemann from Rev), Detective Constable Bill Wong (Matt McCooey), and village cleaner friend Gemma (Katy Wix from Torchwood). A big thank you to Acorn TV for arranging the interview, and Ashley Jensen for being so generous with her time.